It seemed like a chocolate chip cookies kind of day, so I decided to try this (old!) recipe adapted from Cuisine at Home magazine. I’ve typed it up below as a half-batch. 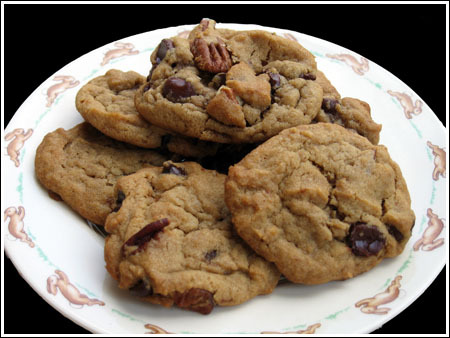 The cookies bake up crinkly, craggly, dense and soft. I’d say more but it’s Monday and there are kids here and I’m writing in spurts. These are great, though. Worth trying if you’ve got the ingredients around. Stir together flour, baking soda and salt; Set aside. Using high speed of an electric mixer, beat both sugars, butter and shortening until creamy. Reduce speed to low and mix in egg and vanilla – do not overbeat after adding the egg. Drop cookies by rounded teaspoonfuls onto ungreased baking sheet. Bake for 12 minutes or until golden around edges and set. Transfer to a rack to cool. Thanks for the comment. I’m always happy to hear that people are using the small and half batch recipes. Great Recipe!!! had just enough butter and this worked out perfectly!! Thanks for the comment! I love it when people have good luck with a recipe. I loved these cookies and i had such a great time making them !!! My mom and i made them and we had such a fun time enjoying ourself and…. They were so delicious i felt like i was in Heaven already . Mum.. Mum….Mumm …. Delicious! Congratulations on your retirement. Also, good for you for trying your hand at some contests. It can be very frustrating not to win, but it makes you feel more victorious when you do, so keep at it. Also, join Cooking Contest Central because all of the contests are listed there….and there are plenty. I use a program called Movable Type for my blog. While I am sure they are doing their best to make it more user friendly, it is more complex than a lot of other blog software. I recommend getting started on blogger. Just sign on to http://www.blogger.com and start reading how to do it. Hi Anna — I’ve been enjoying reading your blog for a while now. I am just retired and wanting to spend more time on my hobby — cooking and baking. Have been entering contests — no wins yet. Want to start a blog of my own as well as continue to read all the good ones, including yours. It’s a little confusing with the blogs. So many ads. Can you tell me if you purchased software or took one of the free deals? Blogger looks good (Google). Thanks for your info. PS — We have something in common — I also give away most of what I bake. I have a loyal fan base here in my neighborhood. I made these cookies yesterday and I love them. I didn’t use the nuts, but I am sure that doesn’t surprise you. the only other change I made from what you did was to us unbleached flour (that’s just what I happened to have in my flour jar at the time). Mine came out with a totally different texture from what you described. mine were lightly crisp outside and a bit chewy inside. they weren’t at all dense inside though. not dense, not soft. and there was a crispness to the edges that stayed even after storage. how totally different is that?! but in my case that is good, since that is a texture I really like in ccc’s. thanks for the info on the bakeoff, too. this year they say they will notify on or around september 30th. I wonder if they might go earlier?? was that sept 30th the date they had given you two years ago? or maybe you don’t recall. anyway, thanks for this recipe! I recommend them! Me too Anna – I frequently (!) buy the 5 pound bag from Sam’s of the Ghirardelli. Ghirardelli 60% chips are the only bittersweet chips I can find around here. They have a good, strong and very distinct bittersweet taste so I only use bittersweet chips when I want that specific type of flavor. For other recipes, I prefer Hershey Dark chips and Nestle Semi-Sweet chips. When I feel like spending a little more money, I buy Callebaut chips — which are very smooth and velvety. So really, it depends on the recipe. But if I mention “bittersweet” as opposed to dark or semi-sweet, then that means I used Ghirardelli. It’s definitely my favorite bittersweet chocolate that comes in chip form. I was wondering, do you have a favorite bittersweet chip that you use? I am going to email you the answer to this comment as well. The day was either September 13 or 14 of 2005. It was around 6:00 and I was giving Fuzz a bath. Joe, maybe you could switch to a hotel with a microwave. You could do some “Culinary in the Hotel Microwave” posts. Oh sure… post these when the movers are here packing up all my cookie making supplies! We’re thinking about bringing our toaster oven with us for the hotel, maybe we’ll have to do some hotel-chocolate chip cookies when we get out there! AK and Fuzzy had a good time today pretending to be meerkats….chocolate chip cookie eating meerkats. Debbi, I have cookie ESP. Kelli, I think dense best describes these. They were really really soft and dense but not cakey. Anna, when you entered the last pillsbury bakeoff, about what time did they contact you as a finalist? I’ve been wanting to try a new chocolate chip recipe lately and these look like they’re calling my name. I’ll let you know how they turn out. You must have just KNOWN that I had exactly 1/3 C. shortening left! Ya!